It’s Sammy the shark’s first day at school. He’s super excited. But when Sammy’s excited, he BITES things! CRUNCH! MUNCH! Sometimes he nibbles his paintings, or chomps on the class storybook. But when Sammy’s really excited – oh dear! No, Sammy – NO! 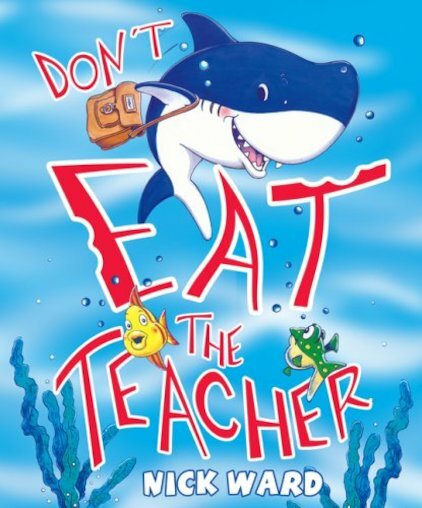 PLEASE don’t eat the teacher! Nick Ward studied graphic design at university and on leaving college he became a freelance designer. He began writing and illustrating his own picture books in the late 1970s. He has written several successful titles for Scholastic including ‘Don’t Eat the Teacher!’ and ‘How to Be a Practically Perfect Pig’. He lives in Buckinghamshire with his wife and family.